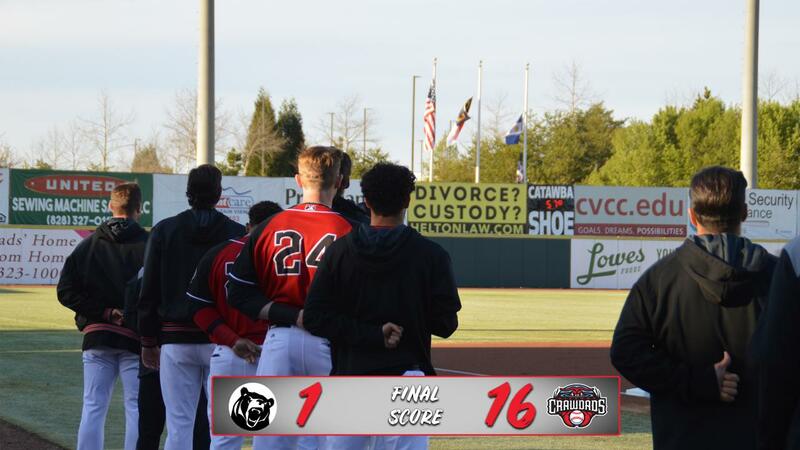 Hickory, NC- The Hickory Crawdads defeated the Lenoir-Rhyne Bears 16-1 in an exhibition game on Monday night. The 'Dads racked up 18 hits and 14 strikeouts in the victory. Catcher Sam Huff hit a three-run homerun in his two for three evening off the bench. Miguel Aparicio collected three hits on the night along with three RBIs. Pedro Gonzalez had three singles and a double. Nine different hitters picked up an RBI and eleven players crossed the plate for a run. On the mound, the 'Dads handed the ball to nine pitchers with each getting an inning of work. Righty Jake Latz got the start and struck out two in his inning of work. The staff combined to hold the Bears hitters to five singles. The Crawdads will head to Lakewood on Wednesday and to kick off the regular reason on Thursday evening against the BlueClaws. They play four games in Lakewood followed by three in Greensboro before returning for the home opener on Thursday, April 11th. The game will begin at 7pm and gates will open at 6pm. Fans who wear black as part of the stadium "Black Out" will receive discounted $6 tickets. There will also be a magnet schedule giveaway presented by Absolute Tree Care and WHKY 1290 AM & 102.3 FM.